If none of these messages are signed with proper pgp key then DONT believe they are who they say they are. We are working on the new roadmap, which we will release soon, so stay tuned. May be, listing on Cryptopia? What sence in Cryptopia? They have hundreds coins and low volume. Developers must fix errors and than list to some good exchanges. If they are working on a new timeline, then it could provide also new hype as new listing on big exchanges, new partnerships, software upgrades, etc. The way the price is acting, I'd not expect any less than a huge pump. Can you tell us about Bytecoin future. What the team is up to? What we, investors, can expect? lol... roadmap? rly. so this coin will actually see updates in the future? Thanks for caring. Technically there is no conventional "admins" in Bitcointalk, but we have been answering and making announcements in this thread from this account for quite a while. This channel of communication is listed on the Contact tab of the official website. Why has the team not released the reason for the coin being delisted? That was a week ago and yet we still have no response. I have a feeling poloniex will be next, there's been issues with the wallet for ages. Without this coin being on big exchanges the price will really fall. im here to help you guys with any promotion or something. Thanks for the info, ruslan3791979. This info is not correct: I have just checked Bytecoin deposits via Poloniex API and they are still open with 2000 confirmations. 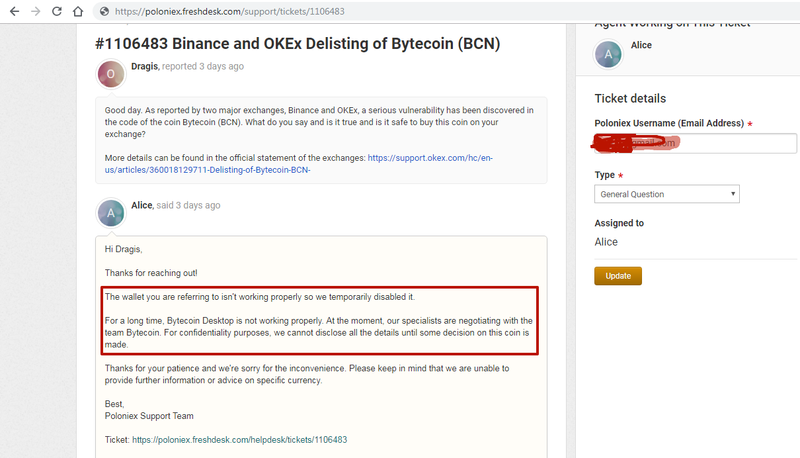 Bytecoin deposits were temporarily disabled for a short time before the confirmations number was changed to 2000, and the screenshot says that the conversation has happened 3 days ago, so maybe the conversation had happened during that period. Currently we are in close communication with Poloniex. I made a transfer of the BCN from poloniex to a wallet (Cryptonator) and the transfer lasted only 10 minutes...That was yesterday. Today I made another one and the time was same:10 minutes. Unexpected fast! Today I made a little note for you (Reddit.com). Perhaps it will be useful. Thank you very much. I fully understand and appreciate everything you wrote. There is something wrong with this coin dev is not cooperating with big exchanges and failed to make them satisfied as they are claiming. I think they should explain on current situation to let know the community on these issues and what solution they have to make it back. What did you really imply by posting the attached image? Personally, I have not seen unique and/ or breaking features of Bytecoin in comparison with other coins in the image. We would be glad if you give us any proof of these memory leaks.